The need for the LCC Terminal was triggered by the high growth of passenger movements recorded by Malaysia's no frills airline, Air Asia. The LCC Terminal is located about 20 KM from the KLIA Main Terminal Building (MTB). The LCC terminal is specifically designed to suit the Low Cost Carrier (LCC). 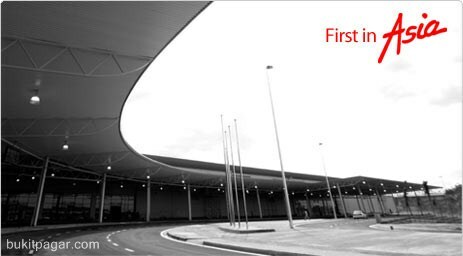 Air Asia, Asia's leading and largest low fare airline, and its associates Thai Air Asia and Indonesia Air Asia will be the main airline operators at the new Low Cost Carrier Terminal, occupying up to two thirds (44 of 72) of the check in counters. The terminal's facilities include duty free shops, F&B outlets, a money changer and a comprehensive public transportation system all made available on a single level mode of operations. The LCCT terminal is simple and basic one level building only. The Domestic and International departure entrances are in the same centre hall. You won't miss with the striking MacDonald sign to look for. The check-in counters and departure gates are not far from each other about less than 50m walk. The domestic departure gates on your right and the international on your left once you enter the main departure hall. From the boarding gates you can see the planes park not too far from the gate. So overall it won't be much long distance walks at all. No worry if you are check-in late not like what you need to sprint km away to get to your gates over in KLIA if you are late! Anyway, 45 minutes before departure time is the final boarding for Air Asia. There are only few rows of plastic chairs in the middle and a row of seats at the side. There one ATM next to international departure gate and one authorised Money changer there next to Coffee Bean. The food outlets are MacDonald, Asian Kitchen and Coffee Bean. You can get chicken rice, soup noodle and some bread and pastry at the Asian Kitchen. You have to go down the escalator at KLIA. Then you'll reach the bus terminal; you'll head straight to platform 8 which is actually on the right. You do not need to buy any ticket, its on sale on the bus itself. The parking lots is just in front of the building and they are using chips instead of card. The first 2 hours are RM1/hr and subsequent hours at RM2. Full day parking at RM30/day. Skybus can be easily located parking just outside of the main entrance of the terminal. 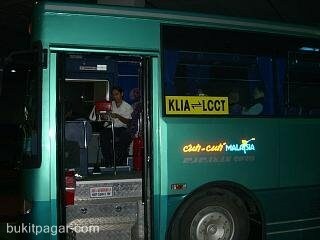 For only RM9 per trip from LCCT - Sentral or Sentral to LCCT the most cheap and best way to get here. Earliest from Sentral to LCCT is 3.30am and latest from LCCT to Sentral is 1.30am.